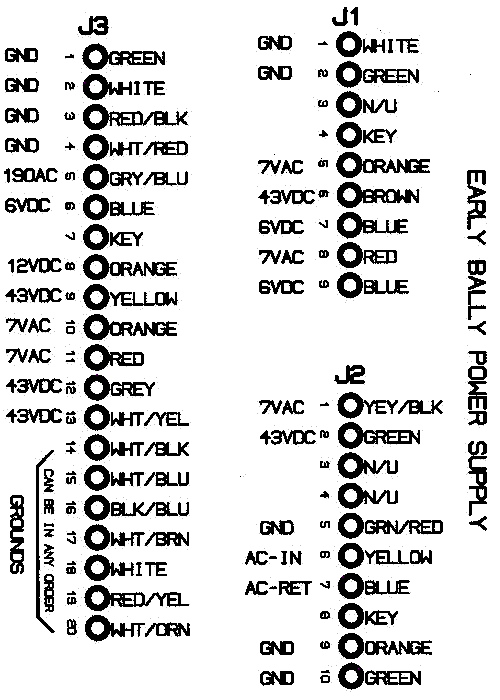 » Forum » Tech » Tech: Early solid state » Bally Experts Needed - First Playfield Swap didnt go so hot. » Bally Experts Needed - First Playfield Swap didnt go so hot. Bally Experts Needed - First Playfield Swap didnt go so hot. I have 2 issues, possibly more. I just swapped my first playfield into my bally star trek. It is not a CPR playfield so I attempted to cut some corners, which I am sure are coming back to bite me here. I attempted to move everything over in one piece. Instead of running new ground braid I used a stick on conductive tape. Do all of the lamps run off of one ground or are there separate grounds for the GI and controlled lamps? When I leave the bottom right connector on the power driver board disconnected neither of the fuses blow. With the bottom right connector disconnected I still do not have any controlled lamps. Any tips or tricks to narrowing this down would be great. Thanks for the help! There is no ground braid for the controlled lamps on the playfield. The braid connecting to all controlled lamps is actually 5.4V power. The lamp driver board switches ground to the lamps via each specific wire to the lamps. GI and controlled lamps should not be connected on the same circuit. Yes. One side of the GI AC is connected to ground on the rectifier board to give it a system reference point. I will separate the two and report back. How does the 5.4 braid get its power? ....... so I attempted to cut some corners, which I am sure are coming back to bite me here. I attempted to move everything over in one piece. Instead of running new ground braid I used a stick on conductive tape. Get that tape out of there unless you want a fire hazard. How does the 5.4 braid get its power? There is a (dark?) blue wire coming from the rectifier board J1 pin 7 that connects to some locations on the playfield controlled lamp braid which supplies 5.4VDC. If you don't have bulbs in the pops yet, sometimes they can be a dead short when new. Once a bulb is in them, they stretch out and are no longer shorted.